Quick, find a mirror. Now, close your eyes. Take a deep breath. Again. Now open your eyes. Repeat these words: who am I here to help today. Leadership has never been about you. Leaders are empowered by their teams, and their goal is simple: serve the team. The concept of a selfless, aka servant, leader is to service their teams – removing roadblocks, addressing concerns, or whatever is needed. But why is this style of leadership valuable? Harvard Business Review authors Jeanine Prime and Elizabeth Salib’s research advocating for selfless leadership. In their ‘The Best Leaders are Humble’, the authors research indicates that selfless leaders inspire innovation, positive behavior, and increased team engagement and support. Despite Prime and Salib’s, and other research, selfless / servant leadership is limited. Leadership expert and Harvard Business School author Jim Heskett believes selfless leadership is rare. Heskett’s 2013 ‘Why Isn’t ‘Servant Leadership’ More Prevalent’ argues that servant leadership places extreme demands on the leader. But, let’s face it, the feeling you get from supporting someone makes the leadership burden worth it. Right? No one said leading would be easy. But, it is worth it. Put yourself last. Go the extra mile for a team member. Be hands on when you can. It shows you care, and that goodwill ripples through your organization, and your soul. Want more on leadership? 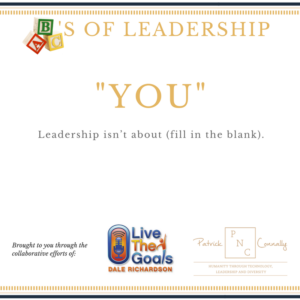 Check out my partner Dale Richardson’s thoughts in his Live the Goals podcast here!